Nowadays, fireworks are not restricted to the 5th November. Our pets are subjected to loud noises and bangs throughout the year. Although some dogs treat them as normal, some find these noises traumatic. The 2018 PAW report, a survey conducted by the PDSA charity, found that 40% of dog and cat owners report their pet is afraid of fireworks. Dogs commonly have multiple sound phobias with triggers such as thunderstorms or gunshots. Fears and phobias are different. Fear is an adaptive emotional response and can be a normal instinct for survival, alerting an animal to possible danger. Problems arise when the threat is perceived rather than actual. The helpful, adaptive, response becomes harmful (maladaptive), causing fear from everyday noises like the crackling of a log burner. Sensitivity often grows with time, eventually overloading the dog’s ability to cope. This can develop at any age but animals are predisposed if they have socialised less, have certain medical conditions, are aged, or suffer separation issues. It’s interesting that pups born just before autumn firework season are less susceptible to sound sensitivity. Some dogs sensitive to sound show a graded response, proportional to the perceived threat. Others progress to a phobic state which involves an all-or-nothing response. It is these dogs whose wellbeing can be most seriously compromised. 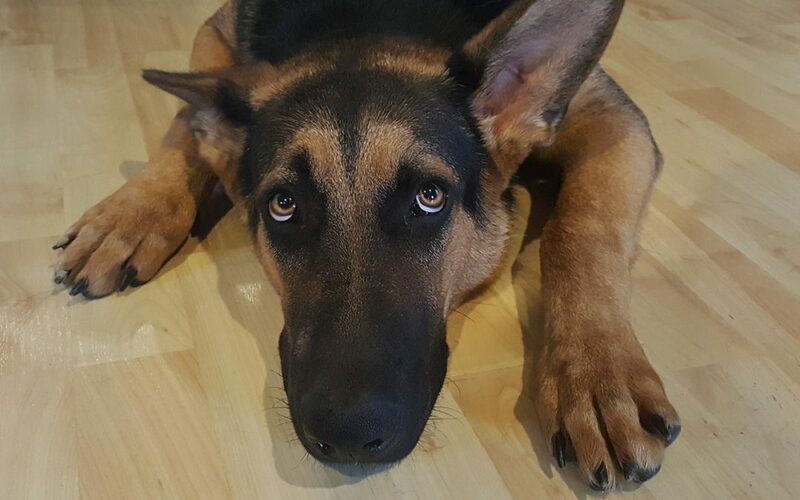 What signs might my dog show if it is fearful or stressed? The reactive response can be so extreme that they may damage themselves, their environment, and even the people or animals around them in a frantic attempt to escape a perceived threat. Vets often see these pets at an earlier stage as their behaviour is more disruptive and stressful for all involved. More inhibited dogs may be interpreted as having milder noise phobias. It does not necessarily indicate a reduction in how afraid they are, though, just that they just show it differently. What should I do if my dog is showing these signs? It’s important not to ignore them. As phobias worsen with time, the earlier these signs are picked up and strategies implemented, the more likely they will help, and the faster the response. Ideally, seek advice before attempting to manage the problem yourself. Some common techniques may not help, and can also delay treatment, making the problem harder to reverse. Some techniques may even worsen the problem. We can advise and direct you to reliable resources, and most importantly check that there are no medical problems contributing to your dog’s signs. Chronic pain, senility, and certain medical conditions may all cause similar behavioural changes. Prevention is always best. CD programmes such as ‘Sounds Sociable’ help acclimatise puppies to a range of sounds that they are likely to encounter in the domestic environment. This may reduce the chance of them becoming noise phobic. Although designed for puppies, these programmes can be used throughout life to maintain acclimatisation. If signs have already progressed then our vets may recommend behavioural therapy, or suggest referral to a behaviour specialist. Behavioural therapy involves a technique called ‘desensitisation and counterconditioning’. Over time, your pet is exposed to a controlled increase in sound levels using a specialised programme like ‘Sounds Scary’, eventually getting to the point where loud noises are tolerated. At this point, counterconditioning is implemented, using treats and positive reinforcement alongside the sounds to associate them with positive memories. Over time, it teaches your pet that loud noises are nothing to be afraid of. It takes several weeks so is unsuitable when a rapid response is needed. Behavioural modification can be frustrating and time consuming but studies show more than 90% of dogs treated with Sounds Scary showed a significant improvement after 8 weeks, although some dogs will take much longer. A pheromone (a chemical released by animals, used for communication) called dog appeasing pheromone has been synthetically developed in the form of plug-in diffusers, collars, sprays and tablets. This pheromone is reported to send calming signals. The Sounds Scary programme, when used in combination with this pheromone, leads to a significant reduction in anxiety during firework exposure. For severe phobias, when even low noise levels initiate fear, medications to reduce anxiety may be prescribed by our vets to aid the process initially, or to get over events such as bonfire night. However, they are no quick fixes and medication is rarely a long-term solution. Simple sedatives are not useful as they don’t reduce fear, just the ability to respond. This will make the problem worse in the long run, and so more sophisticated drugs called “anxiolytics” are now preferred. Some natural alternatives are available as well, so speak to our vets about the options. Building a den that your dog always has access to and enjoys is very helpful. In the run up to known dates, this may help your dog cope. feeding a high carbohydrate meal, inducing drowsiness before dusk. taking your dog for a long, tiring walk well before fireworks are due to begin. keeping pets indoors and making sure they are microchipped in case of escape. drawing curtains and playing music with a repetitive beat to help mask sounds. keeping your behaviour as normal as possible. If you get anxious or comfort your pet more, this may give signals that fear is justified, worsening the situation. Never punish pets for fear-related behaviour such as vocalisation, destructiveness or indoor toileting. Verbal punishments, using shock collars, water sprays or rattle cans will worsen the problem and should never be used. making sure they have access to their den. using a thundershirt. These should only be used as part of a behaviour modification strategy as currently there is no research for their effectiveness against noise phobias.